This article was originally published on cerbero-blog.com on October the 7th, 2013. While this PoC is about static analysis, it’s very different than applying a packer to a malware. OS X uses an internal mechanism to load encrypted Apple executables and we’re going to exploit the same mechanism to defeat current anti-malware solutions. printf("proc %d: set_code_unprotect() error %d "
The text_crypter_create function is actually a function pointer registered through the text_crypter_create_hook_set kernel API. While this system can allow for external components to register themselves and handle decryption requests, we couldn’t see it in use on current versions of OS X. The second encryption mechanism which is actually being used internally by Apple doesn’t require a loader command. Instead, it signals encrypted segments through a flag. The unprotect_segment function sets up the range to be decrypted, the decryption function and method. It then calls vm_map_apple_protected. * The rest needs to be "transformed". * We start mapping in the unprotected area. Two things about the code above. The first 3 pages (0x3000) of a Mach-O can’t be encrypted/decrypted. And, as can be noticed, the decryption function is dsmos_page_transform. Just like text_crypter_create even dsmos_page_transform is a function pointer which is set through the dsmos_page_transform_hook kernel API. This API is called by the kernel extension “Dont Steal Mac OS X.kext“, allowing for the decryption logic to be contained outside of the kernel in a private kernel extension by Apple. Apple uses this technology to encrypt some of its own core components like “Finder.app” or “Dock.app”. On current OS X systems this mechanism doesn’t provide much of a protection against reverse engineering in the sense that attaching a debugger and dumping the memory is sufficient to retrieve the decrypted executable. However, this mechanism can be abused by encrypting malware which will no longer be detected by the static analysis technologies of current security solutions. Since this is our public disclosure, we will say that the detection rate stood at about 20-25. After encryption has been applied, the malware is no longer detected by scanners at VirusTotal. The problem is that OS X has no problem in loading and executing the encrypted malware. The difference compared to a packer is that the decryption code is not present in the executable itself and so the static analysis engine can’t recognize a stub or base itself on other data present in the executable, since all segments can be encrypted. Thus, the scan engine also isn’t able to execute the encrypted code in its own virtual machine for a more dynamic analysis. Two other important things about the encryption system is that the private key is the same and is shared across different versions of OS X. And it’s not a chained encryption either: but per-page. Which means that changing data in the first encrypted page doesn’t affect the second encrypted page and so on. 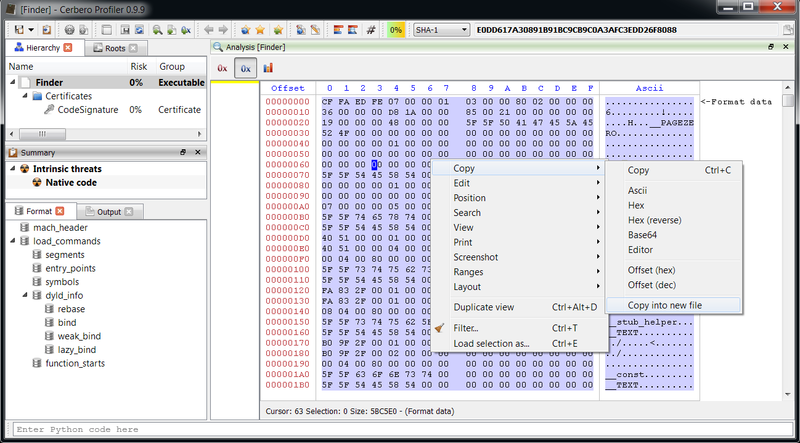 Our flagship product, Cerbero Profiler, which is an interactive file analysis infrastructure, is able to decrypt protected executables. To dump an unprotected copy of the Mach-O just perform a “Select all” (Ctrl+A) in the main hex view and then click on “Copy into new file” like in the screen-shot below. The saved file can be executed on OS X or inspected with other tools. Of course, the decryption can be achieved programmatically through our Python SDK as well. Just load the Mach-O file, initialize it (ProcessLoadCommands) and save to disk the stream returned by the GetStream. Implement the decryption mechanism like we did. Check the presence of encrypted segments. If they are present, trust only executables with a valid code signature issued by Apple. 3. Check the presence of encrypted segments. If they are present, trust only executables whose cryptographic hash matches a trusted one. This kind of internal protection system should be avoided in an operating system, because it can be abused. This is the correct decryption code. In fact, the kernel extension by Apple, just as in the code above provided by Steve Nygard, uses the OpenSSL implementation of Blowfish. We didn’t know about Nygard’s code, so we did our own research about the topic and applied it to malware. We would like to thank VirusBarrier Team at Intego for its cooperation and quick addressing of the issue. At the time of writing we’re not aware of any security solution for OS X, apart VirusBarrier, which isn’t tricked by this technique. We even tested some of the most important security solutions individually on a local machine. The current 0.9.9 version of Cerbero Profiler already implements the decryption of Mach-Os, even though it’s not explicitly written in the changelist. We didn’t implement the old decryption method, because it didn’t make much sense in our case and we’re not aware of a clean way to automatically establish whether the file is old and therefore uses said encryption. It checks the first dword in the encrypted segment (after the initial three non-encrypted pages) to decide which decryption algorithm should be used. This logic has a problem, because it assumes that the first encrypted block is full of 0s, so that when encrypted with AES it produces a certain magic and when encrypted with Blowfish another one. This logic fails in the case the first block contains values other than 0. In fact, some samples we encrypted didn’t produce a magic for this exact reason. So while checking the magic is useful for normal cases, security solutions can’t rely on it or else they can be easily tricked into using the wrong decryption algorithm. Have you ever copied after Vista a system file like notepad.exe onto the desktop and tried to execute it? Have you ever tried after Vista to modify the resources of a system file like regedit.exe? It’s most likely that neither of the two was a successful operation. If you try to copy, for instance, notepad.exe onto the desktop and run it in a debugger you will notice that it fails in its initialization routine when trying to load its accelerators. You take a look at the HINSTANCE passed to LoadAccelerators and notice that it’s NULL. You open notepad.exe in a resource viewer and notice that it doesn’t contain accelerator resources. Thus, you realize that the global instance is associated to some external resource as well. Go back to the system folder where you took the system executable and you’ll notice language directories such as “en-US”. Just copy the one which identifies the language of your system to the same directory of notepad.exe. You’ll notice that now notepad.exe runs correctly. Vista introduced the separation between binary and language dependent resources to allow a single Windows image to contain more than just one language. You can obtain more information about the development aspects on MSDN. The language directory contains files with names such as “notepad.exe.mui”, one for every file they provide resources for (including dlls). These are very basic PE files which contain only a resource directory and are loaded into the address space of the process as they are. 1) By name: just rename the notepad to test.exe and the MUI file accordingly and it still works. 2) Via resource, as we’ll see. // All offsets are relative to start of the structure. Offsets with value 0 mean empty field. You’ll find this structure in WinNls.h. However, this structure is for GetFileMUIInfo, it doesn’t match the physical data. 00000010 12 00 00 00 00 00 00 00 00 00 00 00 EC 6C C4 C4 .............l..
000000B0 0E 00 00 00 10 00 00 00 65 00 6E 00 2D 00 55 00 ........e.n.-.U. The first DWORD is clearly a signature. If you change it, the MUI is invalidated and notepad won’t run. It is followed by another DWORD describing the size of the structure (including the signature). Offset 0 1 2 3 4 5 6 7 8 9 A B C D E F Ascii 00000010 EC 6C C4 C4 .l.. 00000020 FF 7C C9 CC F8 03 C7 B3 8C 8A 67 51 11 72 DC 72 .|........gQ.r.r 00000030 80 73 67 9E AB 20 3D FC AA D4 2F 04 .sg...=.../. 00000010 EC 6C C4 C4 .l..
00000030 80 73 67 9E AB 20 3D FC AA D4 2F 04 .sg...=.../. These two checksums are probably in the same order of the structure. They both match the ones contained in the MUI file and if you change the second one, the application won’t run. There are no other association criteria: I changed both the main file and the MUI file (by using a real DLL and just replacing the resource directory with the one of the MUI file) and it still worked. There are some restrictions on resource updates in files that contain Resource Configuration(RC Config) data: LN files and the associated .mui files. Details on which types of resources are allowed to be updated in these files are in the Remarks section for the UpdateResource function. Basically, UpdateResource doesn’t work if the PE file contains a MUI resource. Now, prepare for an incredibly complicated and technically challenging hack to overcome this limitation… Ready? Rename the “MUI” resource to “CUI” or whatever, now try again and it works. Restore the MUI resource name and all is fine. The new build of the CFF Explorer handles this automatically for your comfort. This limitation probably broke most of the resource editors for Win32. Smart. It has been many years since the last update of what had started as a hobby side-project when I was 19. I’m sorry that I haven’t updated the CFF for such a long time, given that thousands of people use it every day. A few months ago I stopped working for Hex-Rays to fully dedicate myself to my own company and thus I have decided that I have now the time and the energy (barely) to finally update the CFF. Over the years I’ve received several bugfix requests, but couldn’t oblige because of the lack of time. If you’re interested that a particular fix goes into the upcoming release, please leave a comment under this blog post or drop me an email to ntcore@gmail.com (feel free to repeat the request, as it might have been lost during the years). Please don’t include radical changes or improvements, we’ll leave that for later maybe. If your company needs professional PE inspection (not editing), I’d advice you to check out my current commercial product at cerbero.io/profiler, which doesn’t cover ‘just’ the Portable Executable format. You can continue to leave comments or send me emails. As soon as there are enough new bug reports, I’ll upload a new version. In time, maybe, some small improvements could be included apart from bug fixes. … Or why stealing software is stupid (and wrong). A small guide to detect software theft for those who are not reverse engineers. Under my previous post the user Xylitol reported a web-page (hxyp://martik-scorp.blogspot.com/2010/12/show-me-loaded-drivers.html) by someone called “Martik Panosian” claiming that my driver list utility was his own. Since I can’t let this ignominious theft go unpunished :P, I’ll try at least to make this post stretch beyond the specific case and show to people who don’t know much about these sort things how they can easily recognize if a software of theirs has been stolen. In this specific case, the stolen software has been changed in its basic appearance (title, icon, version information). It can easily be explored with a software such as the CFF Explorer. In this case the CFF Explorer also identifies the stolen software as packed with PE Compact. If the CFF Explorer fails to recognize the signature, it’s a good idea to use a more up-to-date identification program like PEiD. However, packing an application to conceal its code is a very dumb idea. Why? Because packers are not meant to really conceal the code, but to bind themselves to the application. What is usually difficult to recover in a packed application is its entry-point, the IAT and other things. But the great majority of the code is usually recoverable through a simple memory dump. Just select the running application with an utility such as Task Explorer, right click to display the context menu and click on “Dump PE”. Now the code can be compared. There are many ways to compare the code of two binaries. 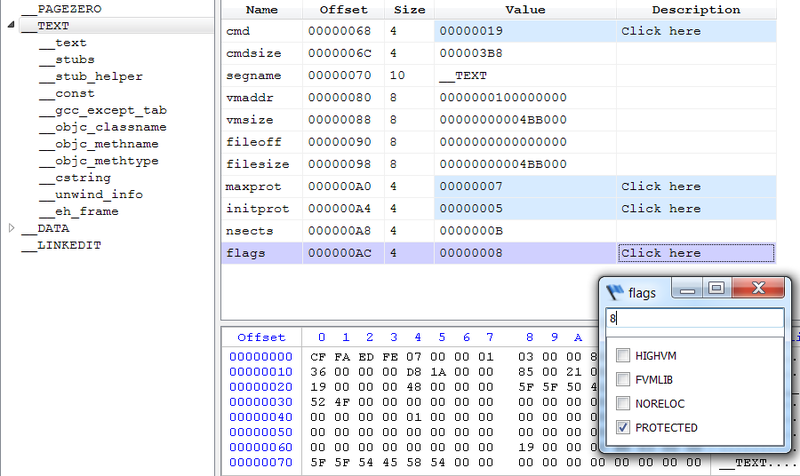 One of the easiest is to open it with IDA Pro and to use a binary diffing utility such as PatchDiff2. If the reader is doing this for hobby and can’t afford a commercial license of IDA Pro, then the freeware version will do as well. 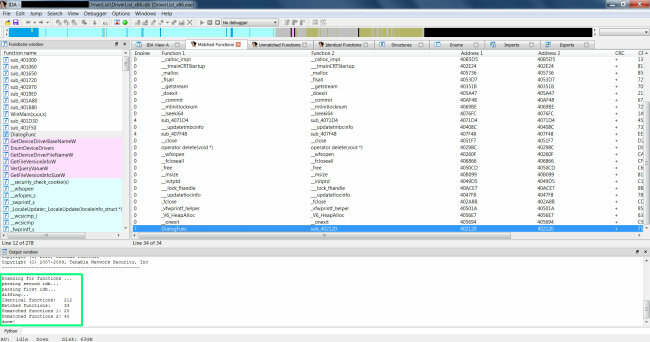 Just disassemble both files with IDA Pro and save one of the idbs. Then click on “Edit->Plugins->PatchDiff2” and select the saved idb. As it is possible to see, not only were the great majority of functions matched, but they also match at the same address, which proves beyond doubt that they are, in fact, the same application. It’s important to remember that a limited number of matches is normal, because library functions or some basic ones may match among different applications. A comparison of two applications can even be performed manually with IDA Pro, just by looking at the code, but using a diffing utility is in most cases the easiest solution. There’s a malware circulating that contains my name in its version information. I’m, of course, not the author (putting one’s own name in the version info would be brilliant). I’m clarifying, as three people already contacted me about it since yesterday. It was probably done on purpose and it’s not the result of a random generation of different version info, as I suspect. What the author/s of this malware ignore, is that they made me stumble on an additional technique against malware, that’ll probably damage their business and force them to work more. Given my very limited amount of spare time, it’s too soon to discuss this.